In January 2017, in a 3-2 vote, the Ventura County Board of Supervisors advised the Planning Division to study potential new restrictions and regulations covering 420,000 acres, approximately 30% of Ventura County. This includes 164,000 acres of both public and private property that cuts through the heart of Ventura County, naming it the Habitat Connectivity and Wildlife Movement Corridors. Then, in August of 2018, the County of Ventura proposed to add additional restrictions and regulations. What Ventura County residents need to know is that the County Board of Supervisors is moving fast. They are pushing to implement the Wildlife Corridor zoning ordinance and its related land use restrictions and regulations in March of 2019. The impact of this on landowners and the community will be devastating. New restrictive regulations preventing landowners from conducting fire prevention measures will increase the already dangerous threat of devastating wildfires. For reference, the Thomas, Hill and Woolsey fires scorched over 383,000 acres and burned over 3,183 structures. The recent fires destroyed wildlife populations and their habitat. The National Park Service estimates that the Santa Monica Mountains lost half of its habitat in the fire, burning 100,000 acres or 88 percent of the area’s federal parkland. The lack of clarity in these regulations would result in projects, from simply installing fencing to planting crops in the county, be subject to the discretion of the County Planning Director. It is important to note that the original Wildlife Corridor zoning proposal was designed to maintain existing wildlife passage points, not to create new ones. Essentially the Wildlife Corridor ordinance is a conservation easement with no compensation to land owners. It does not provide any allowances for the individual needs of families who own and pay taxes on Ventura County properties. Many of the recommendations for the Wildlife Corridor are based off of studies and models conducted over 13 years ago. As an example, there is a corridor indicated on the new zoning map that fully encompasses the Bell Canyon subdivision. 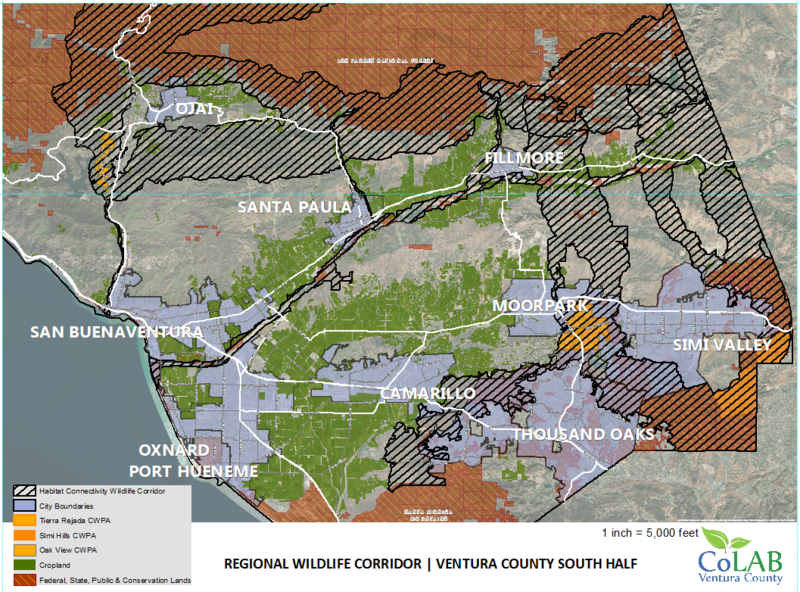 A Surface Water Overlay map has been created showing how 200 foot “buffer zones” overlay properties within the Wildlife Corridor in Ventura County. However, the map includes man-made features, for example ponds and swimming pools that were purposely excluded in the ordinance language from new “wildlife buffer zones”. Landowners will have to pay County planners and consultant biologists to remove unintended restrictions on their land. If you are concerned about this proposed Wildlife Corridor, the changes that will be made to existing zoning, the new restrictions and regulations imposed on landowners and the threat to public safety, your voice needs to be heard. Ventura County CoLab is a non-profit organization of farmers, ranchers, business professionals and experts collaborating to promote sensible and rational government in Ventura County. VC CoLab supports land stewardship and preservation of economic livelihoods. CoLAB Ventura County provides a funded, full-time local presence to balance environmental, regulatory and economic concerns. Our efforts include monitoring local public agencies and elected boards where we commonly testify on regulatory issues. We cooperate with the COLAB groups in Santa Barbara and San Luis Obispo Counties forming a tri-county force. Your support of time or donations can help to ensure that Ventura County remains a family and farm-friendly community. Where's the Beef or Where Does the Beef Come From Exactly? Could New Bird Flu In California Be Result of Proposition 2?